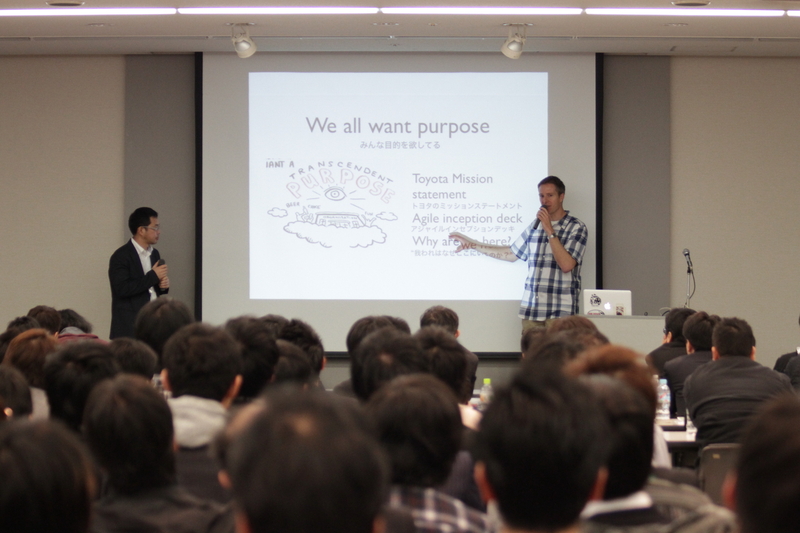 As a young engineer in an Agile team, I am very excited to joined Agile Japan 2012 Tokyo satellite together with about other 200 attendances and enjoyed a great keynote speech from Jonathan Rasmusson. As the author of the famous book < Agile Samurai >, Jonathan talked with us about agile leadership model and why it works in software production, with the title “The surprising science behind agile leadership”. At the beginning, Jonathan introduced us a small story about leadership. It is about how a manger enhance his worker’s motivation and productivity at common industry. By asking his workers writing down their output numbers on a wall everyday, he achieved his goal easily. As his workers can check and compare their outputs with each other very easily, they will compete with each other and achieve higher and higher output. And the most important is that all of them become very happy. How about using this simple method in software industry? It is quite difficult because the outputs and team velocities in software industry are not easy to show and compare. However, agile leadership model works quite well. Why? For the answer of this question, Jonathan introduced us two models by showing us a movie about some scientific experiments at MIT. First is profit model, more reward more works. But it does not works well especially for complicated tasks. Second is purpose model. Yes, people not only works for profit, but also works for purpose! And for a interesting purpose they want, people can given up their current jobs and works for free. It is amazing, right? After that, Jonathan introduced why the management in software industry should change. In fact, although software industry already lasted 40 years and it is changing very fast, management method doesn’t change with it. Currently, old command and control management method are still widely used, which works good at compliance but terrible for engagement. In this software industry, new management method are needed as we need idea, autonomy, mastery and purpose. To make us better understand software industry, Jonathan compared software production with theatre production. About theatre production, it has a hard deadline, it highly depended on actors, it has uncertain outcome and each play is different. Very similar in software production! We have hard deadline and budget, every engineer is independent individual with unique talents, our production is different every time and we go our separated ways at the end of software development. And for theatre production, for software production and for other industries, we all need have freedoms, our earning potentials will be based in merit. 1. Give people freedom over task time technique team. Let them choose, people are seeking their purpose while money is only one reason. 2. Pay more than average, to attract better talent and reduce turnovers. Of courses, we need to try taking money off the table. 4. 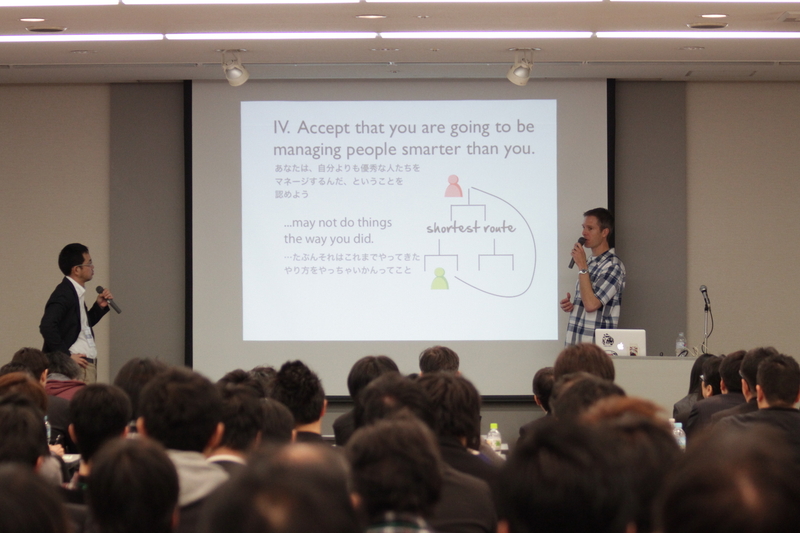 Accept that you are going to be managing people smarter than you. In fact, manager cannot know anything as things are changing fast. At last, Jonathan said ‘one more’ and gave us his last suggestion to managers: you’re people always want to do great work, you just need to get out of their ways. That is all from Jonathan’s impressive speech. As a new comer at an agile team at good atmosphere, I learned a lot from this speech and finally found the reason why our team have high motivation and good productivity. We always share our purpose at the beginning of every project, we use Kanban and Scrum to manage our tasks and progresses, we have enough freedom and maybe a little higher salary than average. Yes, our team is running under a good agile management model. However, agile is not the silver bullet and every agile team need their own work model. But definitely, they need purpose, need autonomy and need freedom. So I hope not only managers can learn how to lead their team with a new way, but also our common engineers can learn how to cooperate with the new management of leadership.